Placing one If Statement inside another If Statement is called as Nested If Else in R Programming. The R If Else statement allows us to print different statements depending upon the expression result (TRUE, or FALSE). Sometimes we have to check further when the condition is TRUE. In these situations, we can use this Nested If Else concept but, please be careful while using it. For example, every person is eligible to work if the person is 18 years old or above but, the government or any company will not give job to every person. So, we use another If Statement (also called as Nested If Else Statement) to check his previous experience, educational background, or any job specific requirements. In this article we will show you, How to write nested If Else statements in R Programming language with example. Before we get into the example, let us see the syntax behind the R Nested If Else statement. 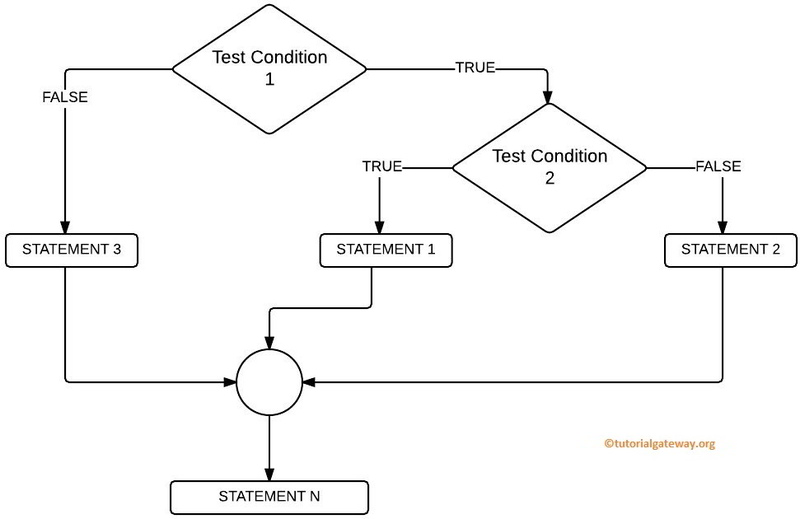 If the Test Condition 1 is FALSE then STATEMENT 3 will be executed. If Test Condition 1 is TRUE then it will check for the Test Condition 2. If it is TRUE then STATEMENT 1 will be executed Otherwise, STATEMENT 2 is executed. 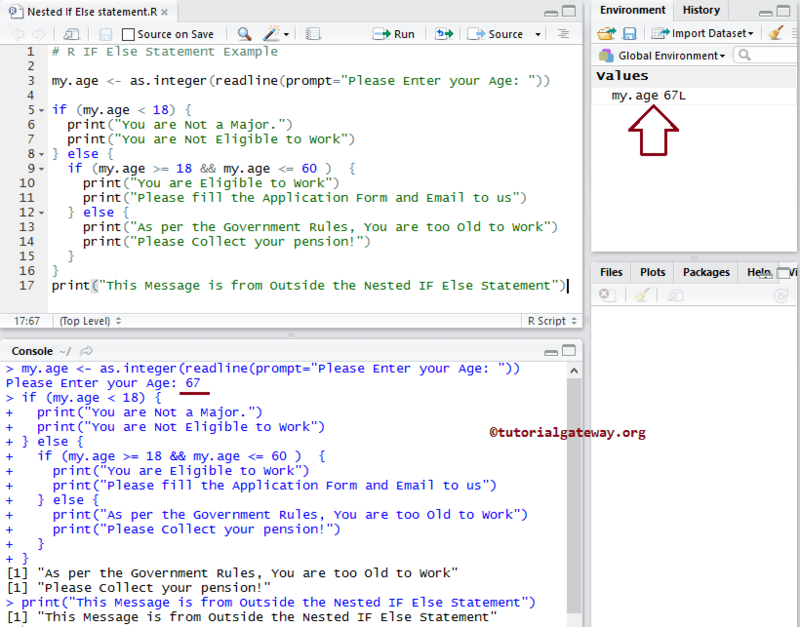 This program allows the user to enter their age, and then we are going to store it in the variable my.age. If the user specified age is less than 18 we are going to print two statements. If the condition fails we will check one more condition (Nested If Else) and if it succeed we print something. If the nested condition fails we print some other thing. If the specified person age is less than 18 then he is not eligible to work. If the person age is greater than or equal to 18, first condition fails, it will check the else statement. Within the Else statement there is another Boolean expression (this is called as Nested If Else). 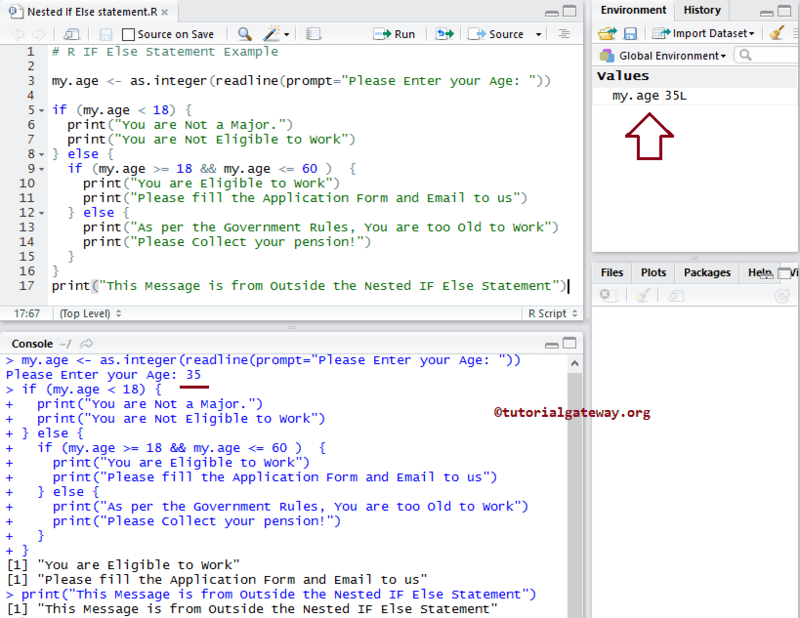 Nested If Else Statement will check whether the person age is greater than or equal to 18 and less than or equal to 60. If the expression is TRUE then he can apply for the job. If the expression result is FALSE then he is too old to work as per the government. We placed one print statement outside the If Else block, and it will be executed irrespective of condition result. 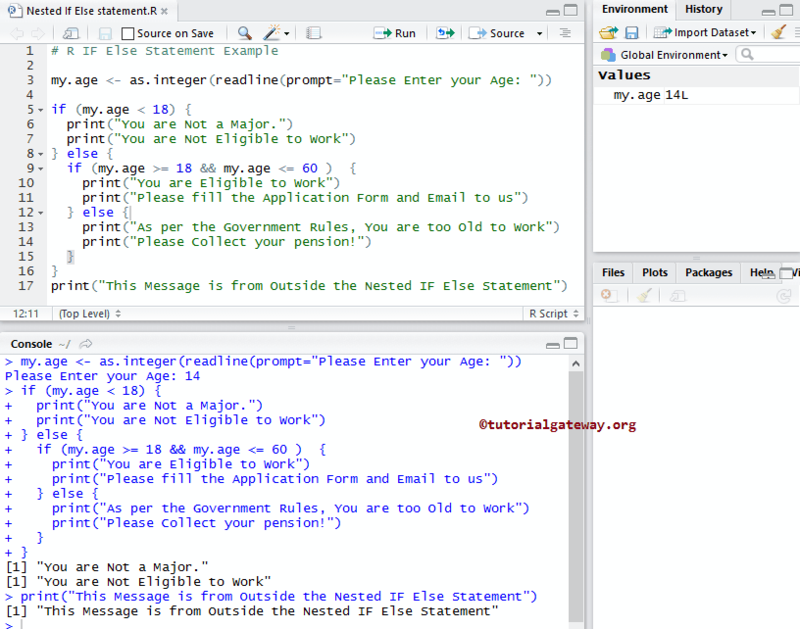 OUTPUT 1: We are going to enter age = 35 means first IF condition is FALSE. It will go to else block and within the else block, it will check the if (age >= 18 && age <=60), which is TRUE so it will print the statements inside this block. OUTPUT 2: From the below screenshot you can observe that, We entered the age = 14 means first If condition is TRUE. That’s why the statements inside the first If block is executed. OUTPUT 3: This time, we are going to enter age = 67 means first If condition is FALSE. It will go to else block and within the else block, it will check the expression if (age >= 18 && age <=60), which is FALSE that’s why it will print the statements inside Nested else block.